Last week the Columbus Dispatch ran an article remembering the Kahiki restaurant on the 10 year Anniversary of its closing. I’ve copied the article and the photos here so if the newspaper takes the story offline in the future, we will still have access to it. Enjoy! "It's amazing that these things are still happening." "We were sorry within two weeks that we sold it," he said. "We had this great big gong, like 4 to 5 feet across, that went bong, and right after we sold it they replaced it with this little thing that went ting." Tsao's son Jeff said that before his father unloaded the restaurant he had grand dreams for relocating the Kahiki to the riverfront Downtown. But it never panned out because the factory got busy and government support fell short. Then his father died unexpectedly. "I don't know if it could ever happen again," Jeff Tsao said. "But we're very, very pleased and thankful that we still have so many fans." But that doesn't necessarily soften the blow. "I think a lot of people are still bitter about it. 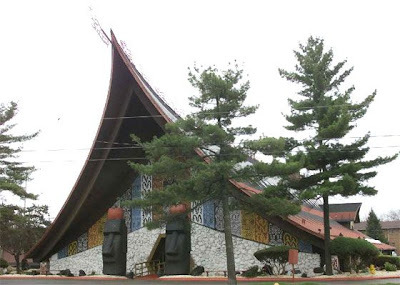 We all miss it," said Stu Koblentz, who was a member of the Ohio Preservation Alliance when the organization labeled the Kahiki one of the top 10 endangered historic buildings in Ohio. There are dozens of active Kahiki tribute websites and discussion boards. 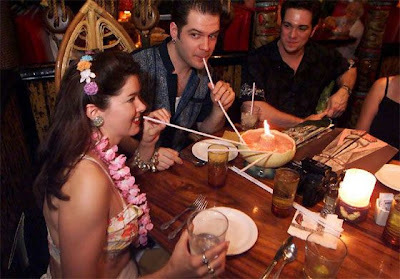 There are photo albums on TikiCentral.org full of Kahiki swag - drink stirrers, napkins, toothpicks, salt shakers and matchbooks. Dionysus Records produced vinyl copies for sale online, and they're selling. "When I was a kid and we'd drive by the huge sloping roof with dragons and torches, it always seemed to me to be a grounded ship on E. Broad Street," Newark resident Lesa Best said in an e-mail. "There were macaws in the bar, and the booth walls were lined with aquariums, or 'rain forests' complete with thunderous sound effects. By the '80s, it was past its prime, definitely, and cheesy? Yes it was. But my friends and family loved going because it was different, it was campy and the food was really quite good. "I long for just one more Mystery Drink." "When I was a kid growing up in Pittsburgh, my dad regularly traveled to Columbus on business," said Worthington resident Bill Nordquist. "We had a postcard picture of the exterior, and in the mid-1970s I had never seen anything like that." Jennifer Akers grew up nearby and begged her parents to take her there for her birthday. They told her the Kahiki wasn't in the budget for a family of six, so she never set a foot inside. "I spent hours and lots of dollars buying treasure," she said. "I have boxes of menus, match boxes, napkins, cups. I have the boss' couch right out of his office." 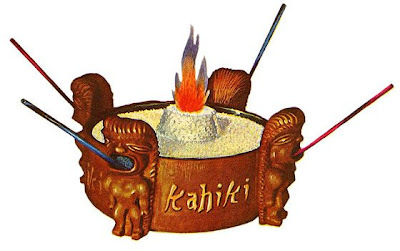 New Yorker Frank Decaro flew to Columbus when he heard the Kahiki was closing. Ten years later, he still can't believe they tore it down. 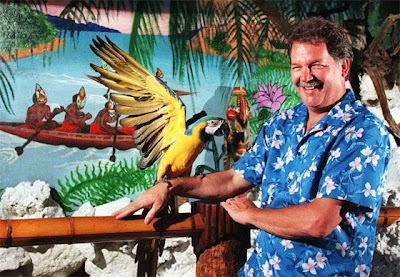 "At the point when the last great Tiki bar closes, someone will open a new one and everyone will say these are great," he said. "It's a shame we always seem to realize too late how much things mean to us." The exterior of the Kahiki restaurant, a longtime landmark on East Broad Street. 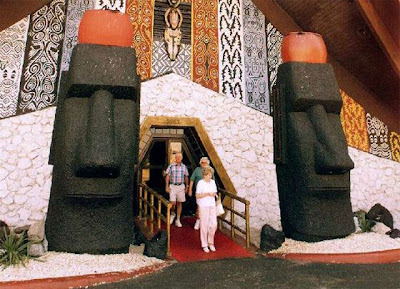 The dramatic entrance to the Kahiki. The restaurant under construction in 1961. 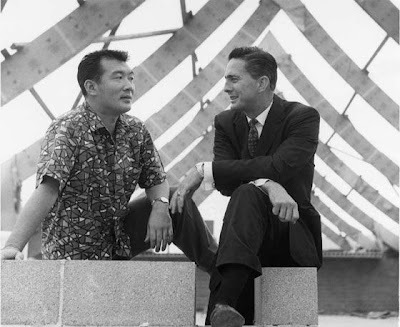 Manager-to-be Hal Naguchi with Lee Henry, one of the two owners of Kahiki at the time, under arches depicting a New Guinea meeting house. 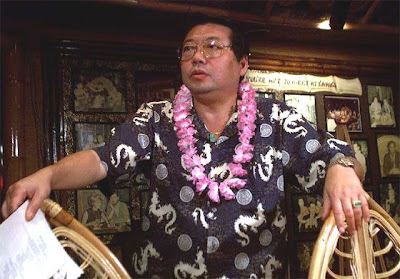 Micheal Tsao, owner of the Kahiki at the time it closed in 2000. 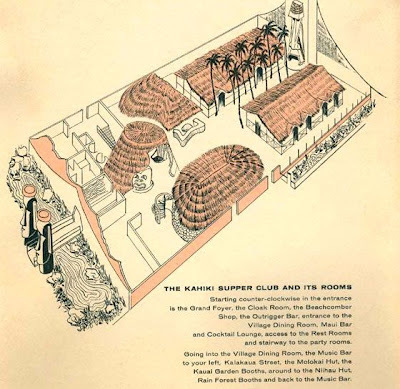 Detail from a promotional brochure showing the layout of the restaurant. 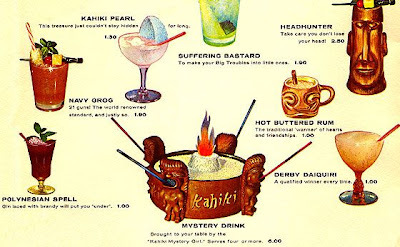 Detail from the menu of exotic drinks. The famous Mystery Drink would be delivered to the table by a Mystery Girl. The drink served four people. Visitors from Chicago share a Mystery Drink in August 2000. Many people wanted to make a last visit to the restaurant before it closed. The Kahiki featured various exotic birds and fish. Maintaining them was the job of Jim Rush. 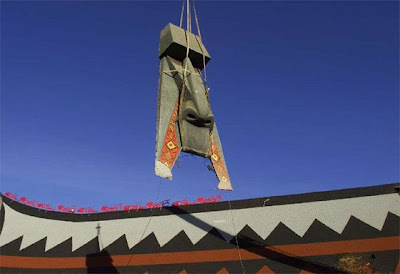 On Oct. 31, 2000, the fireplace Tiki god was lifted through a hole in the roof of the closed restaurant. Here is an interesting follow-up email that I received the other day about this article. If die-hard Kahiki fans want to see what the building looked like, they should visit Covenant Presbyterian Church at 2070 Ridgecliff Rd. in Upper Arlington. The architect who designed the Kahiki also designed the church. The Kahiki was built in 1961. The church was built in 1963. 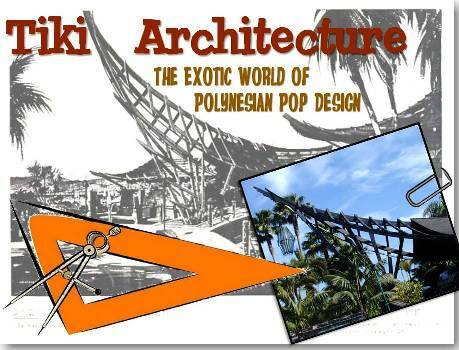 They are basically the same building, except the Kahiki had a curved roof while the church has a straight roof. Inside the church sanctuary, one can see the laminated wood arches which are the same as were used for the Kahiki except for the curvature. Hi Mike! Great Job on the blog. I thought that I would post a ntoification on the near completion of a detailed historic structure report that focuses upon the Kahiki. This project was started several years ago as a part time labor of love. The report utilized an array of historic photographs and original construction plans. Focus areas include a complete structural analysis, exterior facade assessment, roof assessment, interior construction and design, and landscape design. I will make PDF copies available to those who are interested in the details. Me too :o) dedevallo at yahoo dot com Thank you!